Need Ideas? The pictures below show period bathrooms from manufacturer’s catalogs and photos. Often the difference between a bathroom that looks “right” and one that just misses the mark is in the details, accessories, and proper choice of fixtures. 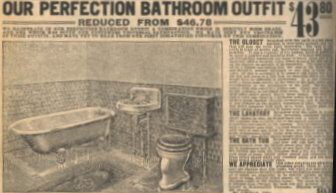 The bathroom at left was featured in an 1888 Mott Plumbing catalog. Note the use of wood cabinetry to hide most of the fixtures and the gas lamp ceiling fixture. The high cistern toilet would most likely have been in a “water closet” of it’s own in an authentic bathroom, but was undoubtedly shown in the room as a matter of artistic license in this manufacturer’s etching. The faded 1908 Sears Roebuck catalog clipping at right isn’t a mis-print, that’s actually a complete bathroom set including a clawfoot tub, wall hung sink, and Low Tank toilet with an oak tank for $43.80! As sanitary laws across the nation began requiring indoor plumbing, Sears stood poised to capture this new market with this and even cheaper “bargain” plumbing suites. It should be noted that earlier Sears catalogs didn’t feature ANY plumbing fixtures as the vast majority of American homes didn’t have indoor plumbing prior to 1910. 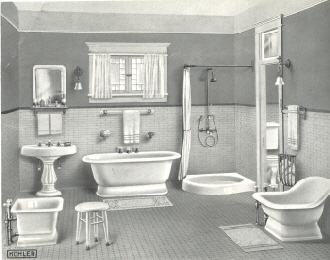 The drawing at left is from a 1914 Kohler catalog. Note the variety of plumbing appliances in the “Deluxe” suite, including both “Sitz” and foot baths, as well as separate bath and shower stall. The toilet is placed in a closet (“Water Closet”), of it’s own. Note the pedestal bases on the baths: pedestal bases were usually found on higher end products, feet on mid and budget priced offerings. We have both original antique and reproduction pedestal tubs, pedestal sinks, and even the occasional Sitz Bath and foot bath for sale in the original antiques section of our website. 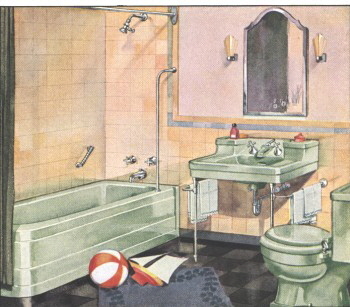 Drawing at right is from the same 1914 Kohler catalog and shows a bit more suburban bathroom ensemble featuring a “peg leg” lavatory, footed tub, and low tank toilet. Note the wall mounted shower ring with handshower. This was a common shower arrangement in these days as daily bathing gained favor over the Victorian customs where bathing was sometimes regarded with suspicion! Also note the dearth of lighting fixtures in all of these suites; electricity was still somewhat novel in most locales in 1914, even in large urban areas. The “well appointed bath” of the time would typically feature a single bulb ceiling fixture and maybe a pair of simple wall sconces. 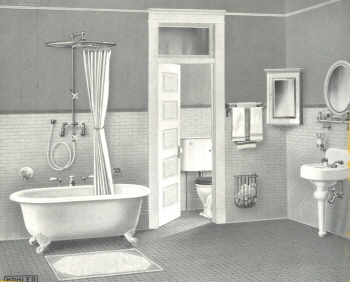 The 1924 bathroom from a Mott Plumbing catalog pictured at left shows several innovations over the bathrooms pictured above: the tub is no longer on feet, it is instead built-in, as is the tiled shower stall with glass door. The bidet and tankless toilet are shown in this “deluxe” suite while more typical baths would have a regular tank-type toilet and omit the bidet. Note the ample use of electric lighting in this nearly “modern” design. We have many original toilets, bidets, mirrors, and light fixtures like the ones shown in the bathroom shown here. Click here to go to the Original Antiques section of our website. 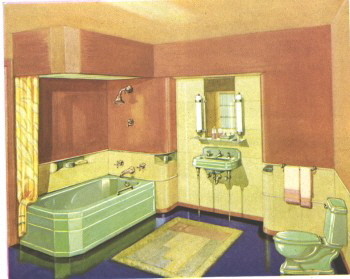 Many design elements still in use today may be seen in this 1928 Kohler catalog illustration. The built-in tub alcove is similar to those used in today’s homes, the tub and shower faucets are built into the wall, and the toilet is of a “close coupled” design; tank is mounted directly on the bowl. Note the colors! Starting in the late 1920s’ manufacturers began offering alternatives to the stark white colors of earlier years. Be sure to check out the early “Art Deco” design flourishes on the fixtures. 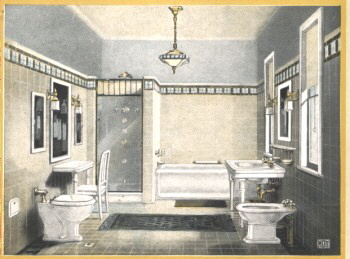 This 1930 Washington Pottery Manufacturer’s drawing is such a great example of a classic 30’s Art Deco bathroom, we used it as the cover illustration on our 2002 catalog. Note the 45-degree angles on the fixtures. These angle cuts, stepped detail lines, and octagon and hexagon design patterns characterize 1930’s Art Deco fixtures. Note also the colored fixtures, built-in medicine cabinet, and fluorescent vanity lights. 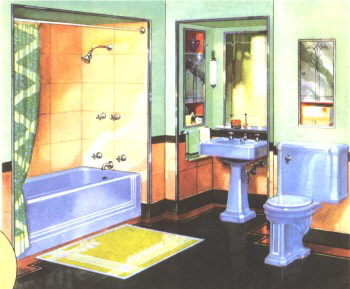 The 1936 bathroom pictured in this Crane catalog drawing shows many of the same design elements as the 1930 bathroom above, including the 45-degree angle details on the tub, sink, and faucets. The arch-top built in medicine cabinet and wall sconce light fixtures are classic examples in bathrooms of this period. Bathroom Machineries specializes in the restoration of vintage bath fixtures and sells a complete line of reproduction and antique fixtures, accessories, and lighting. We hope you have enjoyed our design gallery and will take the time to browse our website.